It's not every day that you get a decent movie-to-video game adaptation. In fact, such adaptations tend to be rushed, low-budget affairs, which is only to be expected when one production team is ruled by another production team's deadlines. Demolition Man is anything but low budget. In fact, while playing it I couldn't help but wince at how much Virgin Interactive must have spent on a game released exclusively for the low-selling 3DO. The non-animated title screen looks cheap, but the rest of the game seems to use $100 bills as toilet paper. The cutscenes use scenes from the movie, including extensive footage of all but one of the four lead actors (sorry, Nigel Hawthorne fans). 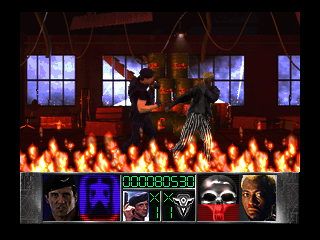 Filling out the cutscenes is exclusive footage with Sylvester Stallone and Wesley Snipes, green screened onto some very impressive prerendered polygonal backgrounds. As if that wasn't enough, they recorded over a dozen video clips of Stallone for the Game Over and difficulty select screens. But lots of money doesn't make a great game. 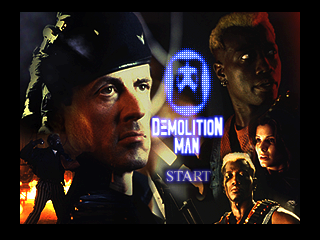 Demolition Man's 16 levels run on four different game engines, and while I'm a fan of this variety approach, Demolition Man suffers its usual downfall: none of the individual styles it attempts are pulled off particularly well. First up is light gun shooting. 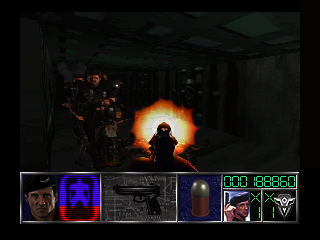 Over half the game's levels are in this genre, though not over half of its playtime; these levels are quickie, shooting gallery affairs, each set on a single static background from which digitized enemies pop out. The level design is pulled off well and sometimes gets refreshingly creative. In particular, two levels could almost be called puzzle games, as you must figure out which pieces of the scenery to shoot in order to draw head villain Simon Phoenix out from cover. So what's the problem? The control. While both standard controller and Gamegun are supported, neither is implemented well. With the standard gamepad the cursor moves too fast, making aiming unnecessarily frustrating. The Gamegun is promising at first, as you can daisy-chain it to a standard controller so that hey! there's an extension cord for your gun, and you don't have to switch out controllers when you reach a non-light gun level. 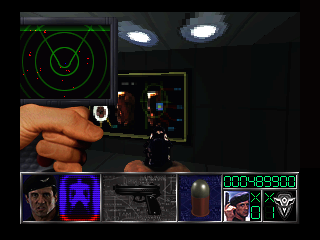 But the cursor continues to obstruct your view while using the Gamegun, the accuracy is not good, and there's no way to manually reload, allowing enemies to get in free hits whenever you empty a cartridge. The Gamegun is still the overall more fun choice for these levels, but if you were planning on buying a Gamegun just for this game, think again. Next we have one-on-one fighting. This one seems to frustrate fighting game fanatics, but I've found that it's actually the most solid of the four styles. The approach is different from most fighting games: characters walk slowly and can't jump very high, so the fights are a more realistic exchanges of blows and blocks, without any of the exaggerated dancing around which is customary to the genre. It's executed fairly well, and though all four fighting levels feature Spartan vs. Phoenix, the enemy AI is different in each one. The only major downsides are the limited number of moves and the absence of a multiplayer mode. Third is first person shooting. These two levels are more advanced than the lazer tag minigame in Snow Job, but not by much. In lieu of health and weapons pickups, you have one gun with unlimited ammunition and your health recovers gradually over time. Enemies die in one shot each, and have sprites for four different sides. However, you'll rarely see the back or side-facing sprites, since the crude AI is programmed to make a straight line for Spartan whenever within his visual radius, with some hilarious results. Wonder why you hear gunshots when there's no one around? That's an enemy on the other side of the nearby wall, shooting the wall in a vain attempt to hit you. But these levels have bigger problems. They're huge and labyrinthine, and there's no automap. Ordinarily I enjoy the graph paper and pencil routine, but when the levels are totally featureless - no items to collect, no doors, no switches - it's just boring. The graphics, which are dark and gloomy enough to induce constant squinting, don't help matters. To add excitement, Simon Phoenix appears in invincible form, and you have to elude him. 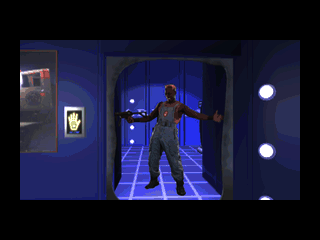 The trouble is, in the second level he's programmed to hound you relentlessly, meaning you don't stand a chance until you've mapped out the route to the exit. Altogether, the first person shooting proves to be more annoying than fun. Finally, there's a single vehicular level. 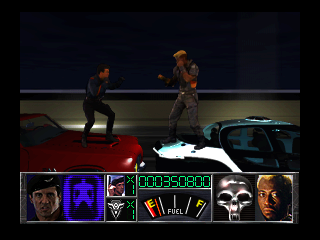 Somewhat comparable to Spyhunter, you move through three different lanes of traffic as you try to catch up with Phoenix. Bumping into other cars slows you down, and you need to nab fuel pickups to avoid running out of gas. It's all quite playable and gives some simple enjoyment, especially once you notice the impressive amount of detail in the scenery, but there's a lack of balance. I didn't read the relevant section of the manual before playing this level and so had no idea what to do, and I still beat it on my first try. So sadly, none of the four engines the game uses is a winner. But neither is any of them a total wash. They're all playable at worst, and it's hard not to feel some simple pleasure at even the worst moments. And that allows Demolition Man's winning feature to come through. The ideal of a movie-to-video game adaptation is to be not simply a good game, but a simulated interaction with the movie - in other words, it should make you feel like you're playing through the movie. This game accomplishes just that, with FMV cutscenes that flow smoothly into the gameplay and gameplay that flows smoothly into the FMV cutscenes. 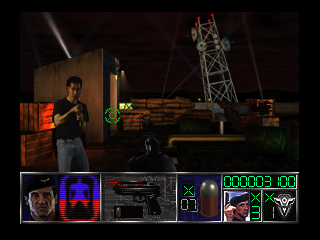 The cutscenes were well chosen, retaining just enough of the movie's plot to drive the action and maintain an independently coherent story, and no more. In other words, you don't need to have seen the movie to follow the story, but you won't get bored waiting for the gameplay, either. Some of the levels retain a good cinematic feel, too, with their fine attention to detail. For instance, in one level Spartan fights Phoenix on top of the hood and trunk of two speeding cars, and there's even a digitized Huxley behind the wheel of Spartan's car. So basically, if you enjoyed the movie, you'll definitely enjoy this game. If not, you should give this one a pass in favor of something more intrinsically involving. Gameplay - Some of the genres the game attempts are done better than others, but they're all relatively stripped down and mediocre. Graphics - As digitized sprites go, the enemies are exceptionally convincing, and fit in well with the CG backgrounds. The FMV is high quality and entertaining. Sound - Both the film soundtrack and new tunes fit in quite well though none are impressive. Voice clips are used with tasteful moderation and add remarkably to the immersion. Longevity - About three hours of content, reasonable difficulty, password system allows you to revisit your favorite levels (or visit secret levels) any time. Loyalty to Source Material - Hey, most of the cutscenes are taken straight from the movie. Plenty of key plot was left out, but this is a fine recreation of the film's action segments. 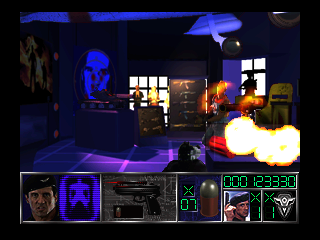 Considered strictly as a game, Demolition Man is thoroughly playable but unimpressive. As a way of playing the movie, however, it rarely misses the mark. Seems like Game Sack is following my lead! See 16:36. Seriously, I think that's the first time I've seen them cover a 3DO game outside of their 3DO-specific episode. They do a very good overview of the game, although their perspective on it is a lot more relentlessly negative than mine. Just a shame that they don't explicitly acknowledge how awesome the movie is (I think their dismissal of the film is just another instance of their deadpan humor, but it really is hard to tell with them at times). This is a funny game, and I know it's not particularly good in any area as you mentioned, but I fell in love with this. I still find it increasingly unfair and difficult due to poor execution, but there's a charm to it. I think that's due to the source material. 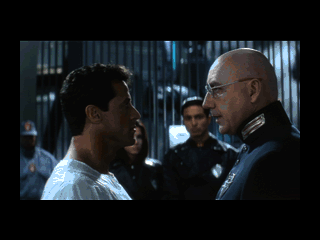 Demolition Man is a great action movie, even today - and nostalgia can't help but bridge some of the flaws. I really would like to play this with the 3DO Mouse, the pad is do-able, but far from ideal.